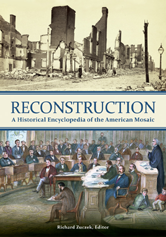 The volume offers a concise introduction to and chronology of the Reconstruction period, scores of entries composed by subject experts, and an appendix that features key primary documents. The entries have been carefully chosen for their importance and relevance, are written in language accessible to high school students, and supply useful references for further investigation. This volume will be indispensable for research into Reconstruction and affords anyone studying the United States during this period insight and perspective, whether the topic be African American history, the Civil War, Abraham Lincoln, or the coming of sharecropping.